Fenny Compton Marina is in a pretty, rural location and offers private mooring for canal boat owners and is just 500 yards along the canal towpath from the local Wharf Inn, a traditional canal-side public house. Fenny Compton village is sandwiched between the Burton Dassett Hills and the Oxford Canal. The village name means ‘settlement in a marshy valley’ and it is very apt as it has its own water company, which is the smallest in England and was founded in 1886. The parish church of St. Peter and St. Clare dates back to c1320 and is Grade 2 Listed. It is dedicated to the Apostle St. Peter and (through its historical links to the Augustinian Canons of Kenilworth) to St. Clare of Montefalco. There is another small place of worship in the High Street, the Fenny Compton Methodist Church. The old part of the village, around the area of High Street, Church Street, Memorial Road, Bridge Street and Dog Lane, has many notable buildings including Woad House, Knotts Cottage, The Red House, The Old School House, The Old Rectory and The Hollies. Fenny Compton has its own school called The Dassett Church of England Primary and it is in Memorial Road, as is the war memorial and the Village Hall. The village has two public houses, The Wharf Inn and The Merrie Lion. 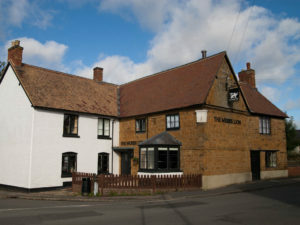 The Merrie Lion is one of the older Grade 2 Listed Buildings in the village and dates back to at least 1710 and is built like much of Fenny Compton and the surrounding area out of the local ‘Hornton’ ironstone. It is a community public house and is at the heart of the village. The Fenny Compton Co-operative Food Store is in the High Street. Iron was quarried out of what is now the Burton Dassett Country Park. The Country Park comprises a series of rugged ironstone hilltops that rise to 666 ft above sea level and offer spectacular views in all directions, together with Fox Covert, which is a small area of woodland with a surfaced footpath. 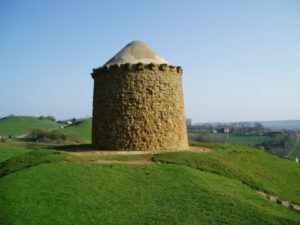 Opened as a Country Park in 1971 and run by Warwickshire County Council, the 100 acres contain a wealth of interest such as the prominent beacon, the quarry remains and the nearby 12th century All Saints Church in the village. This Norman church, built with local Hornton stone, and known locally as the ‘Cathedral in the Hills,’ is a Grade 1 Listed Building and it is a beautiful and tranquil place. The oldest parts of the building are the Norman doorways on the south and north sides. Much of the original medieval daub plaster, a mixture of lime, chopped straw and cow hair, still survives. Outside the church is a holy well which still provides water. Car parking is very restricted in the village, but it is right next to the Country Park with its abundant parking (Pay to Park). The area was once extensively quarried for ironstone and a short industrial railway named the Edge Hill Light Railway existed for this purpose until the 1920’s.